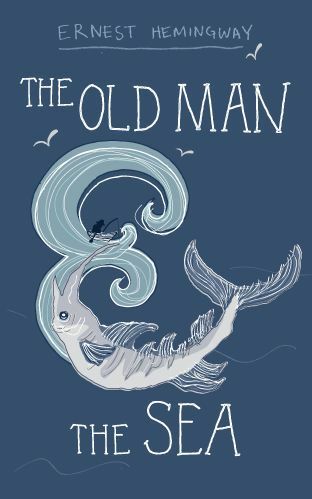 I think everyone has at least heard of The Old Man and The Sea. What held me back all this time was that I had no idea what it was really about and I was scared that I would hate it. It sounds silly writing that down. The story is about an old man… and the sea… duh. The old man is very unlucky. He hasn’t caught a fish in 84 days. Every day he comes back into the harbor and he sees the younger men haul their catch ashore. Every day a boy comes to him to help him carry his equipment back to his hut. The boy used to go fishing with him but because the old man is salao (the worst form of unlucky), his parents have forbidden him to go out with the man. He now works on another boat for a luckier man. Santiago, the old man, tells the boy that he is going to change his luck. He will go out, much further than any of the other boats and he is going to catch the biggest fish. The next day, the old man climbs in his boat and sails out past all the other fishermen and that day he catches an enormous marlin. The only problem is, Santiago can’t pull the marlin into the boat and so the struggle begins. This little book is only about a hundred pages long but it packs quite the punch. It’s the kind of story where everyone reads it differently. I haven’t read many fables before this one, but it made me read more. I don’t feel the need to look into the story, to pull it apart and look at it the way they do at university or high school. I liked it the way I read it. There’s no way I can describe why it moved me, but it did. After I finished it, I couldn’t believe that I hadn’t read it before. Even now, so many months later (I read it in June) it still makes me smile. If you are doubting whether you should read it or not, please pick it up. As I said, it’s only a hundred pages long so even if you don’t like it, it won’t be a huge waste of time. I do hope you like it, though. I hope you find something lurking under the writing, something that will stay with you, as it did with me. Use this link and support me!